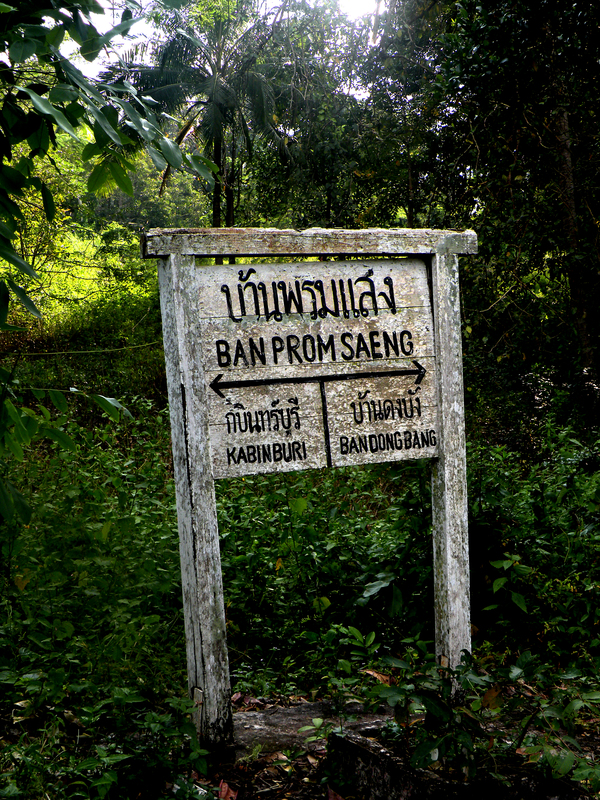 Cambodian border – no problem. Vietnamese border – big problem. First the man on the bus collected all our passports, then he quickly left the bus and went to the building on our left. It was just around this time of a day when day becomes night. We were asked to take our luggage and follow another man inside the same building. Inside we saw security gates and X-ray. Individually we put our backpacks on the belt and walked further to pick them up on the other side. The overwhelming feeling was: “not sure why we do it all, but better stay calm, wait and see what happens”. Then we took the baggage and put it back to the bus hold. And waited. And waited with no information. And waited… did I say we waited? We started talking with other passengers. And then first lot of passports came. Still no information about the remaining ones. One of the travelers was a big, black guy. He was fighting in Vietnam and now came back to see it once again. He didn’t get his passport back and expecting troubles got restless. Overreacting, but then he was here last time in quite different circumstances… In second sort we got our passports back, but the black guy did not. Now he was really worried. He started shouting he is American citizen and his visa is ok. He tried to speak to our driver but well the driver didn’t speak English. I guess most of the passengers (like us) were suprised to hear him being so worried and his loud manifestation of worry did not help to stay calm. Finally the guy came back for the third time and the American got his passport back. We were still waiting for something as the bus didn’t even start its engine. After a while group of four girls were asked to come to the building with our pilot. Polish girls by the way. We got to know each other a little better after this adventure. They were asked to a room on the first floor where a Vietnamese officer in white undershirt was sitting behind the desk. There were some other people there as well. As it turned out there was problem with their visas. The girls did not organize them themselves but trusted their friend to do it for them. So it came out that they had a transit visa not a touristic one – cheaper and valid for only a few days. 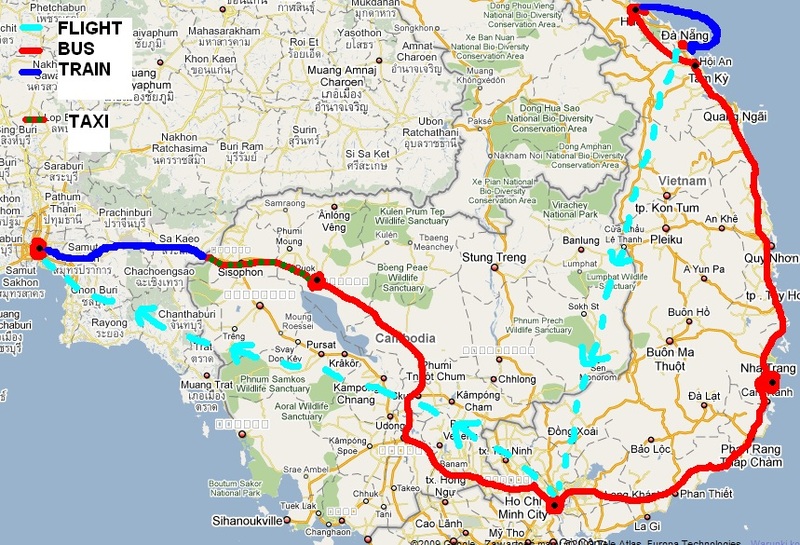 And so were asked to show the itinerary from Vietnam which they didn’t have and $1000 per person which they did have. It was just the beginning of their trip. Of course people who were supposed to pick us up from our hotel were late. We started to think we won’t make it, they forgot about us and we will have to quarrel to get our money back. Very late nonetheless the bus came. We picked up many more tourists on our way and made it to catch the long distance bus to Ho Chi Minh City with a change in Phnom Penh (capital of Cambodia). i wouldn’t bet but I think it was waiting for us. 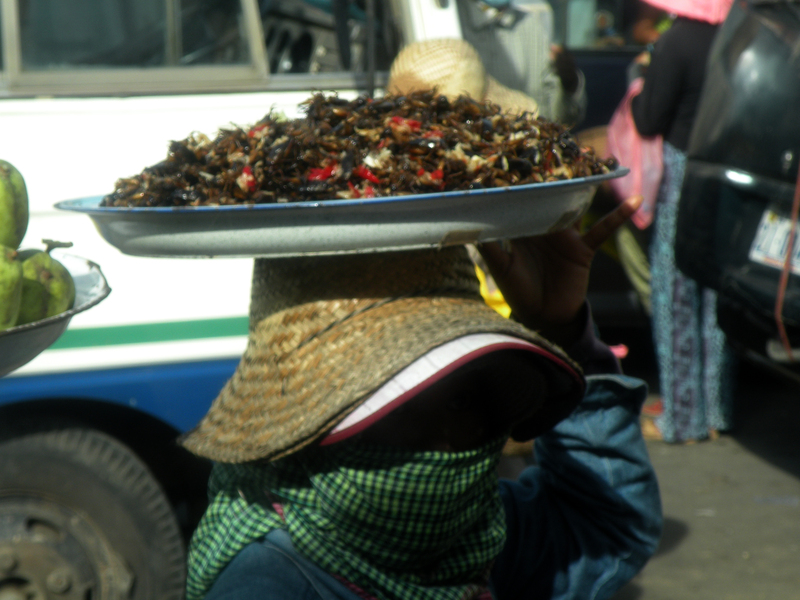 I was very sleepy but tried to stay awake to sightsee and get an impression of the country outside Siem Reap. At the beginning I was failing terribly caught somewhere between sleep and being awake. Finally I pulled myself together and got to know a red haired guy sitting behind me. I think he was from Australia (can’t remember for sure) and had a Cambodian girlfriend. He lived in the country for a while, this not being his first visit here, and absolutely loved it. We talked about why he is coming back to Cambodia, what he loves most about it, how poor the society is and how it’s all changing. I should have written it all down but there are only few stories that I remember. One of them is why there is so much plastic and garbage lying around: people in Cambodia are not used to things that do not decompose. For generations they used to throw away things around themselves cos they were organic and would decompose. Now when the country is flooded with plastic – the habit remains and so does the junk. Also Cambodians are unfamiliar with power (electric current) and often they don’t know which materials are conductors or that they can harm themselves working with power lines without any securities. Crazy things they do because of ignorance, I suppose there is nobody to teach them. This was actually why my new acquaintance was there in Cambodia. I need to stress that foremost his message was that people are friendly and welcoming (especially in the countryside) and how much they need help with the education, sanitation and medicine. At Phnom Penh we had to change the bus. There was police pageant with shields separating our bus from the next one and from anyone who might try stealing luggage from the hold. 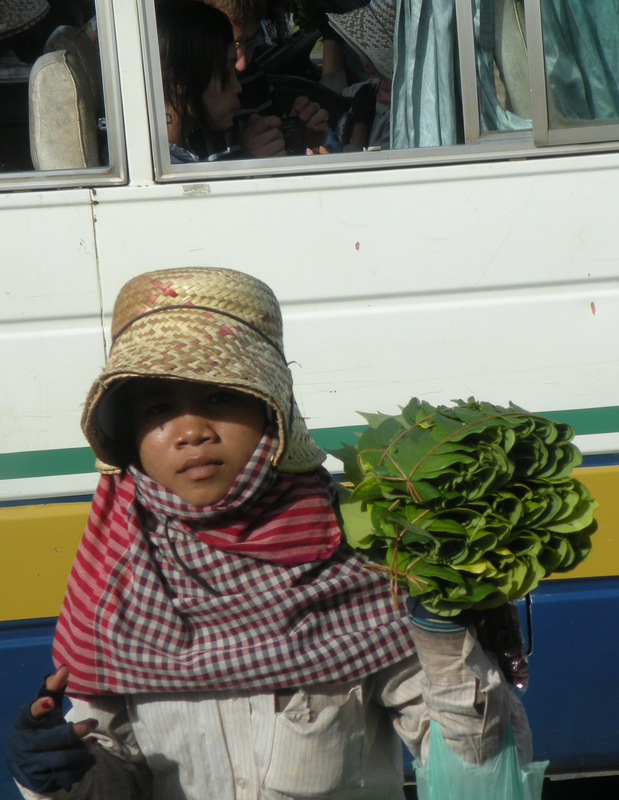 We took our backpacks quickly and were escorted to the other bus that would take us further to Ho Chi Minh City. Before I describe what happened on the Vietnamese border there is one more thing I would like to describe namely the river crossing. We had to wait – as you can imagine – before getting on the ferry. 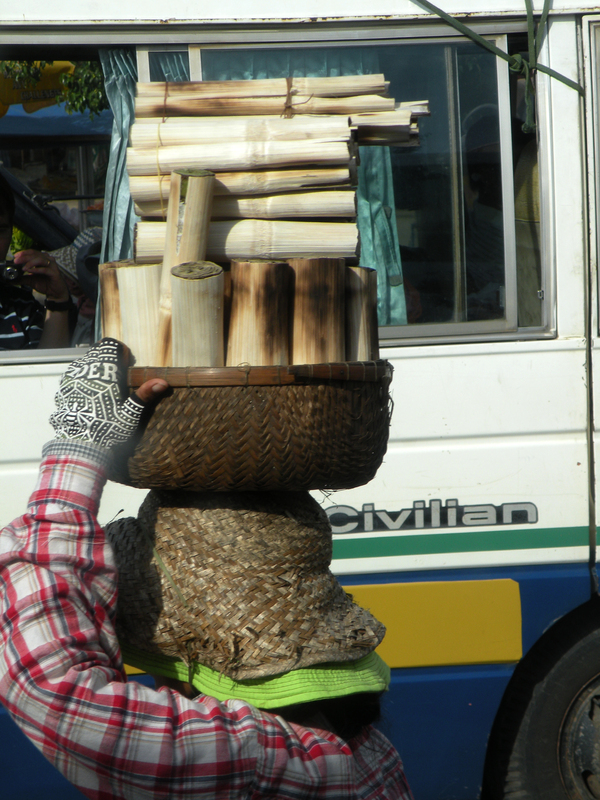 This is when I saw the famous delights of Cambodian cuisine. Have a look at the pictures! I have to admit I didn’t have enough courage to buy any of them, not because of the disgust but being afraid to ask somebody – I get extremely shy sometimes. 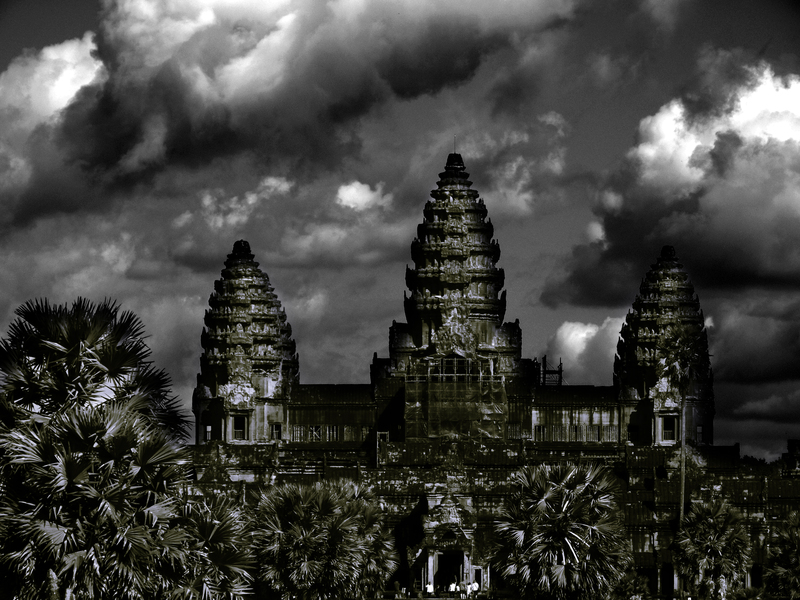 Very interesting documentary on Angkor Wat by BBC. And so, tired but in good moods, we arrived in front of the magnificent Angkor Wat. 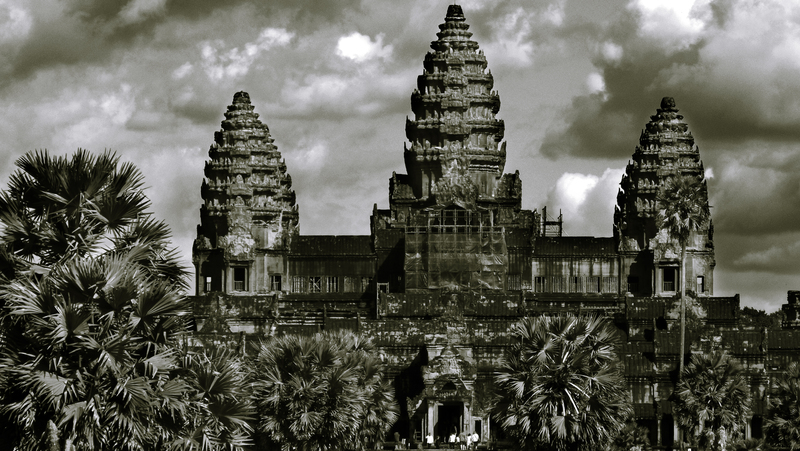 When Frenchman Henri Mouhot discovered the complex in 1860, the natives of the Cambodian jungle were not sure who had built it. They thought that it could have been built by gods, or even by giants! Behind the first gate we met the American couple from Cambodian border. Their trip was a nightmare. They were charged twice for the visa. First time by some men who met them before the border and second time at the border. They were very abusing and would not give the money back. The American went to Tourist Police and only then got the money back. When they were in Cambodia one of the taxi drivers took their luggage while they were bargaining the price (had ticket for the same bus as we did) and wanted to take off while the girl was inside and the guy outside almost driving over his feet. The girl was scared and wanted to jump out of the car when it stopped. So you see how careful you need to be. make sure you pass the border early afternoon. I took pictures of them. The temple is most known for extensive storytelling decoration. These decorations depict gods, apsaras, dancers, battle scenes, mythological events and adventures, stories from the Hindu epics Mahabharata and Ramayana, and war scenes featuring the king and the Khmer army. The five towers can be reached by twelve very steep stairways, were once covered with stucco and gilded gold decorations; the bas relief carvings too were gold-coated. Only traces of these grand decorations remain. Tony dropped us off at the gate, behind it was a path leading to the jungle and temple of Ta Prohm. We didn’t know what to expect so just in case decided not to wander around. You need to remember that in Cambodia the land mines are littered all over the country, especially in the rural areas. Casualties have reached more than 2,000 annually in the beginning of ’90s, but since then have significantly dropped. So do not go off the path. 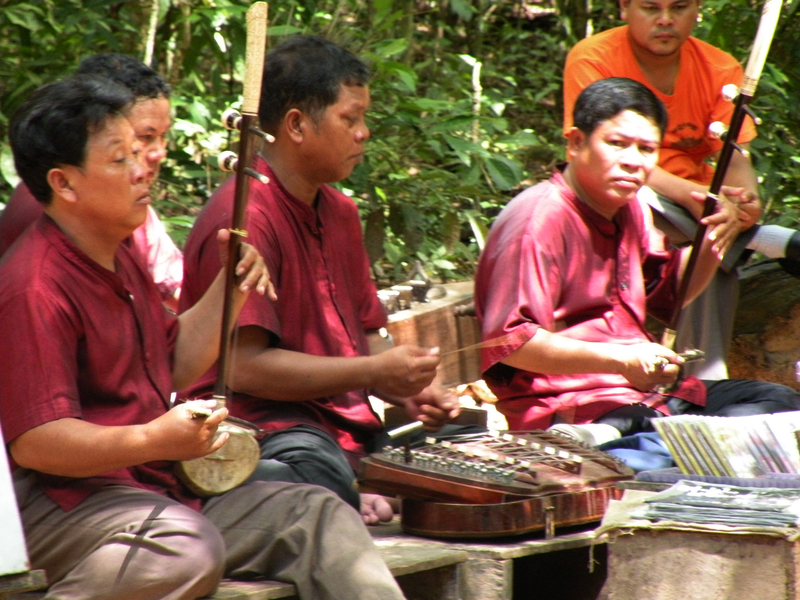 On our way to Ta Prohm we saw a band consisting of people hurt by explosions. Some of them didn’t have legs or arms. They played music on traditional instruments but I can’t honestly say I enjoyed the music. As we were approaching the temple we saw a green swamp and some stones lying around. It made me think: “Are there crocodiles here?” In fact there is a whole industry of crocodile farms in Cambodia. In 2010 they bred 283K small crocodiles. 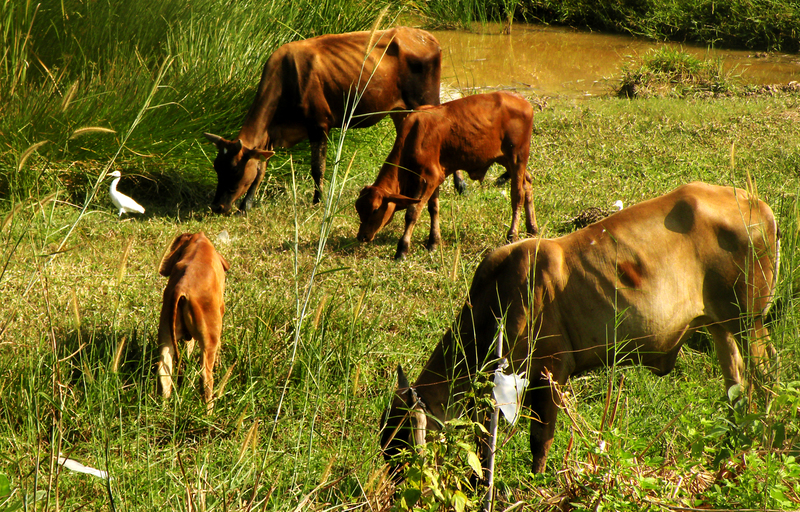 You can visit one of those farms just in the outskirts of Siem Reap. I never really wanted to go, not a big fan of zoo’s, farms and so on. 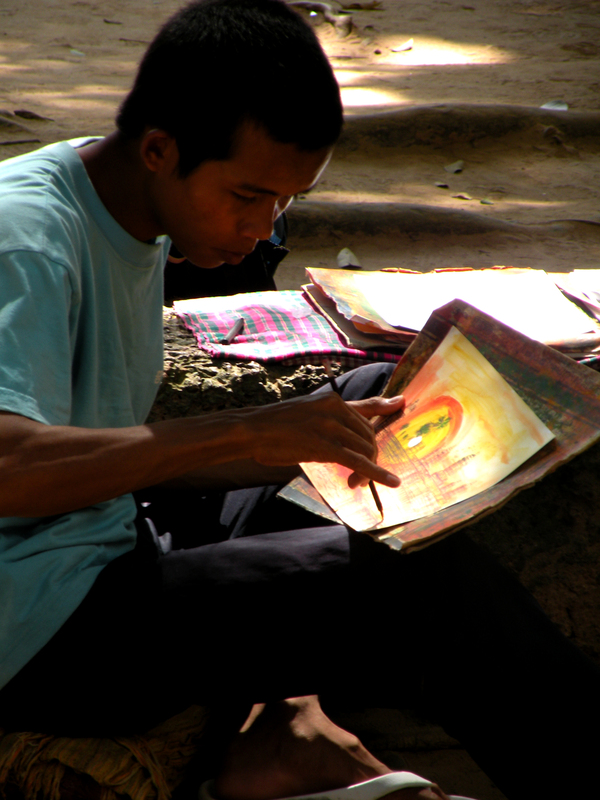 Going further over a bridge we came across a young man drawing one of those popular pictures you can buy from the stalls in Angkor or night market in Siem Reap, defined colors and recognisable temples. It really is a nice souvenir and if you buy it straight from the artist you have a chance to get a better price. I can’t say I recognized the temple as being the scenery in Tomb Reider. Maybe this is because I have seen it long time ago. 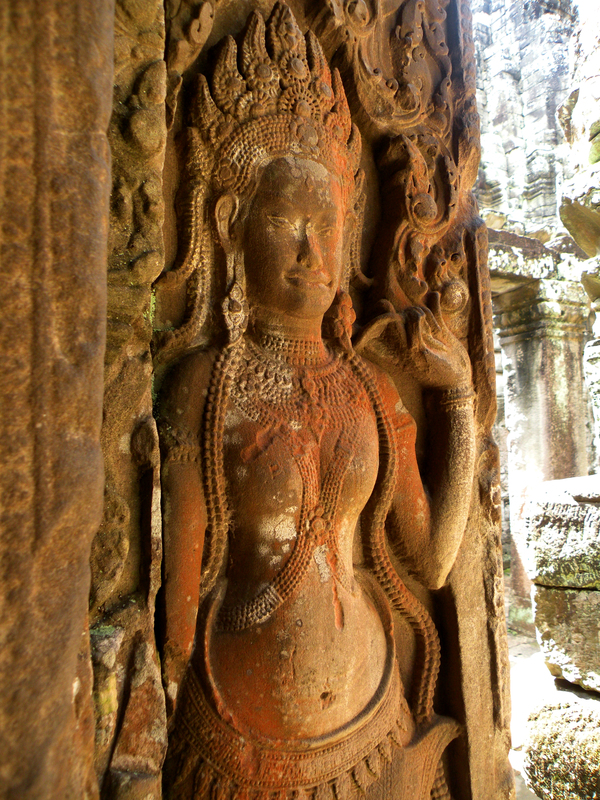 Ta Prohm housed the deity Prajnaparamita, the ‘perfection of wisdom.’ It was consecrated in 1186. 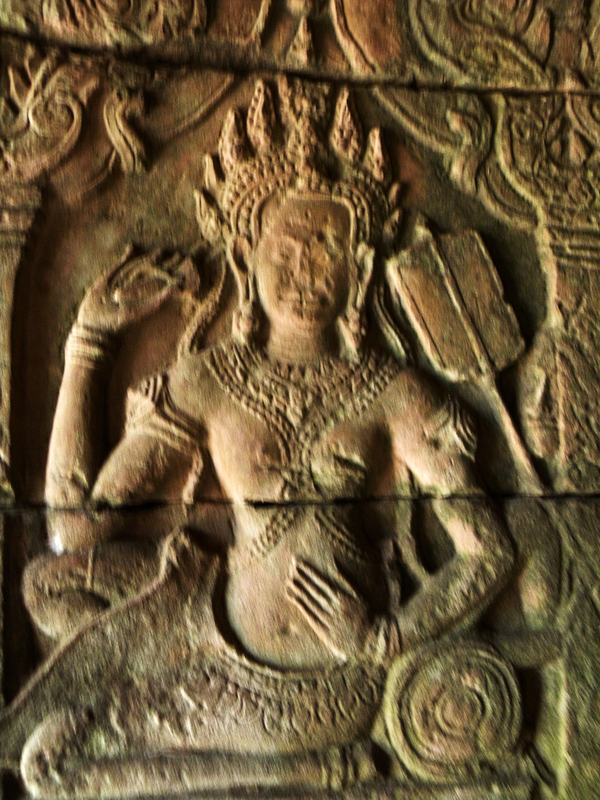 Like many Khmer kings, Jayavarman had it carved in the likeness of his mother. The Prajnaparamita statue was surrounded by 260 lesser divinities, housed in their own sanctuaries. Interestingly, the temple was also the headquarters of a vast hospital network created by the good king. 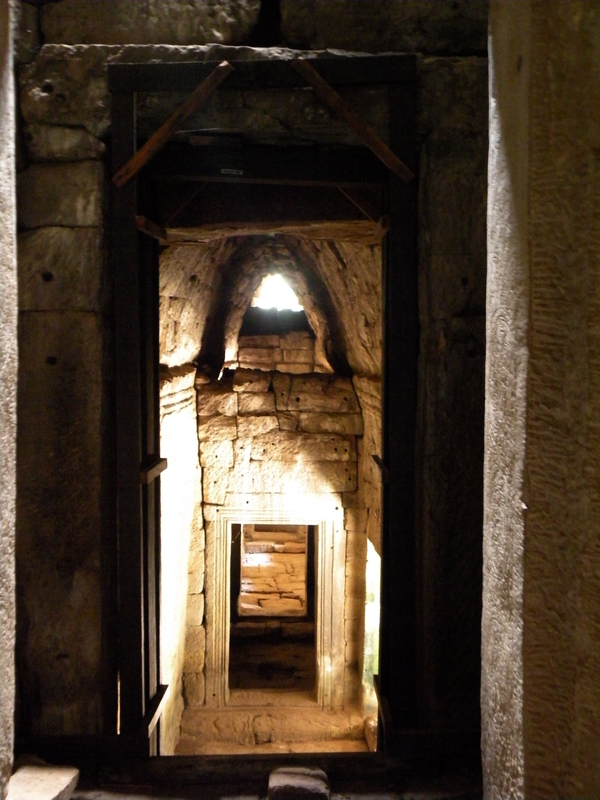 From Ta Prohm, supplies filtered out to 102 hospitals located throughout the empire. 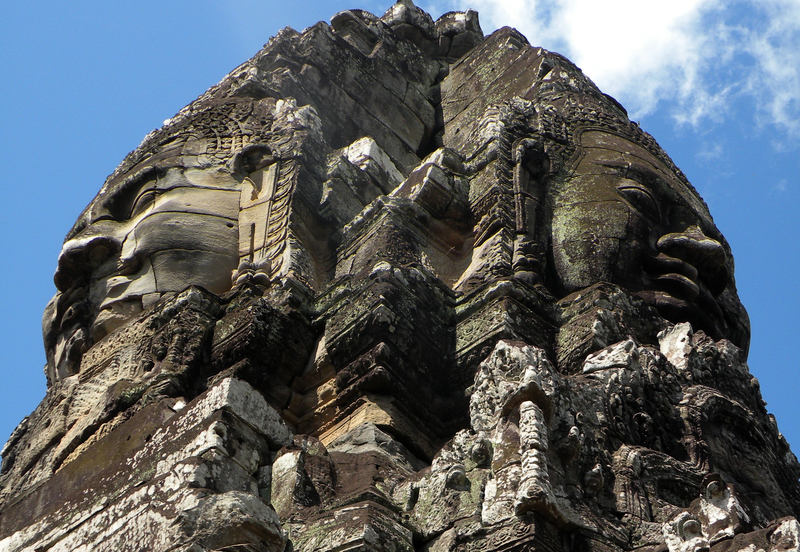 The Khmer kings seem to have taken the Buddha’s call to mercy into their own hands. When we finished sightseeing and came back to the point where we started Tony was nowhere to be seen. On the opposite side of the road we saw some tables and decided to sit down and drink something different than water while waiting. When we got to one of the tables we saw Tony in a hammock waving at us to sit down. “I won’t be a minute!” (well this is at least my interpretation of his gestures!). 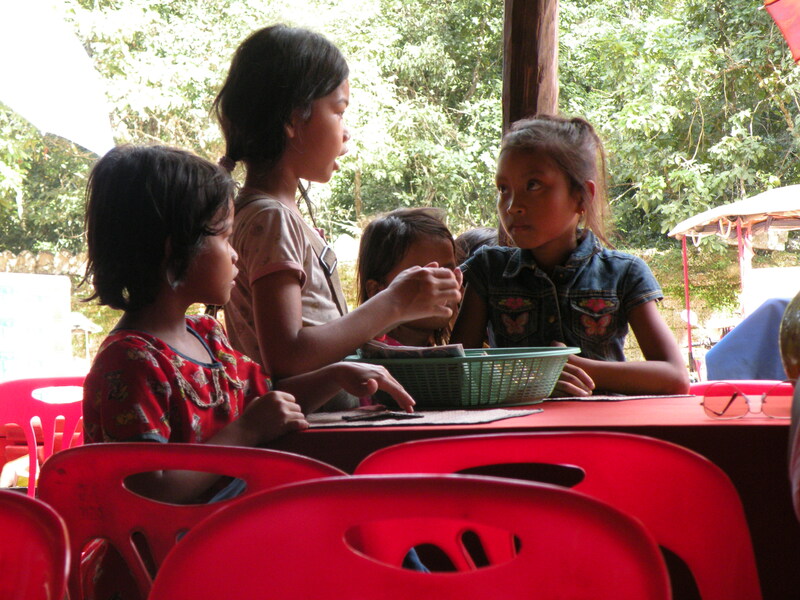 We sat down and observed children discussing post cards and something that seemed an important business arrangements. As you can imagine they were carrying baskets of these post cards for trade. 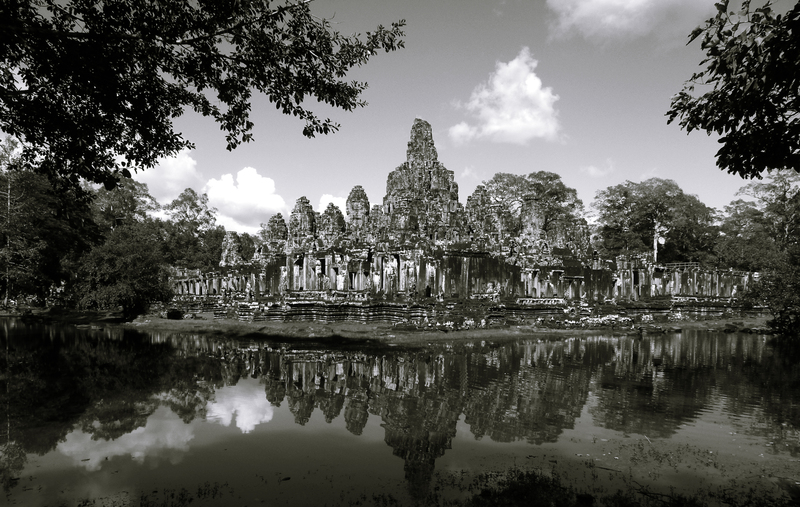 Four of the city’s five gates sat on axis with the temple, and the walls of the city substituted for the enclosure walls normally found at Khmer temples. The walls sit at such a distance from the temple that the temple seems to rise abruptly from the ground like an artificial mountain. In fact, the temple was intended to evoke the form of Mt. Meru—the cosmic mountain at the center of the world in Buddhist cosmology. In keeping with this cosmic symbolism, the plan of the temple is based on a ‘yantra’, a symbol used by Tantric Buddhists as the basis of mandala diagrams that represent the layout of the universe. Long walls covered with collection of bas-relief scenes of legendary and historical events are another reason to visit the temple. 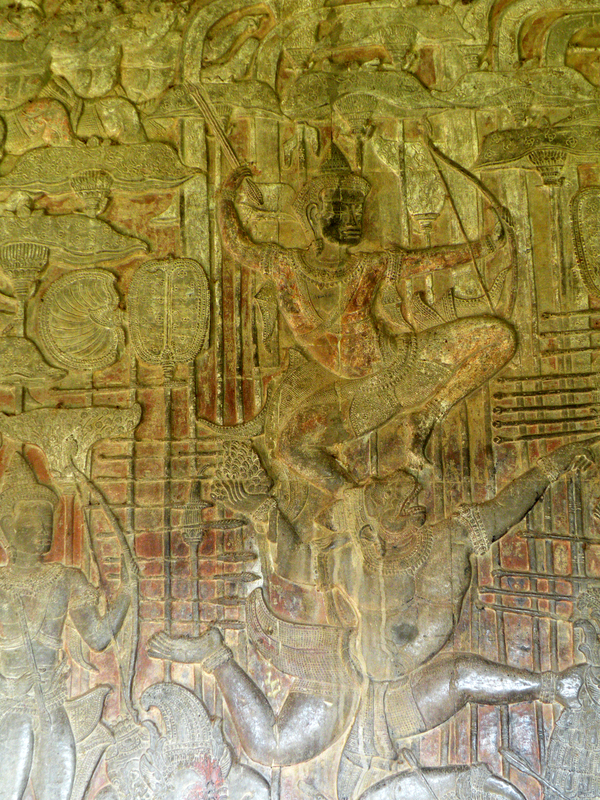 The bas-reliefs on the southern wall contain real-life scenes from the historical sea battle between the Khmer and the Cham. 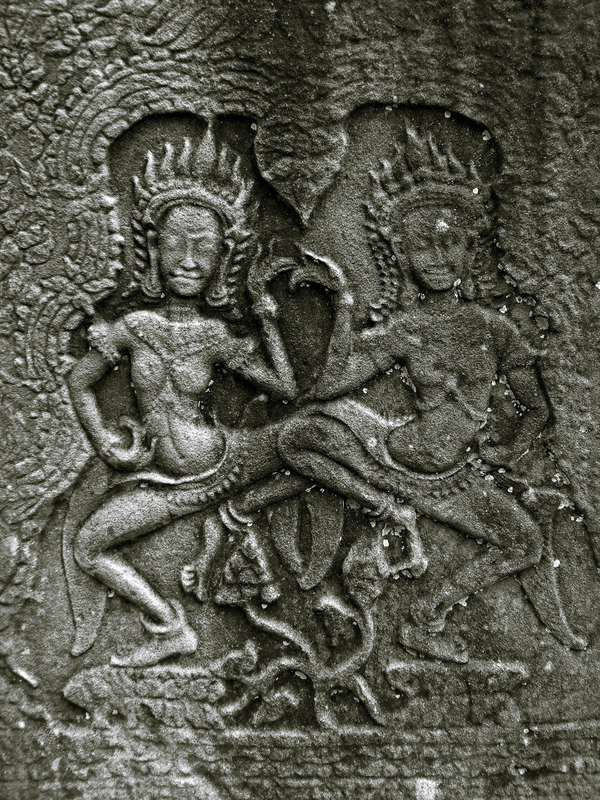 It is not clear whether this represents the Cham invasion of 1177AD or a later battle in which the Khmer were victorious. The Chams on the run. 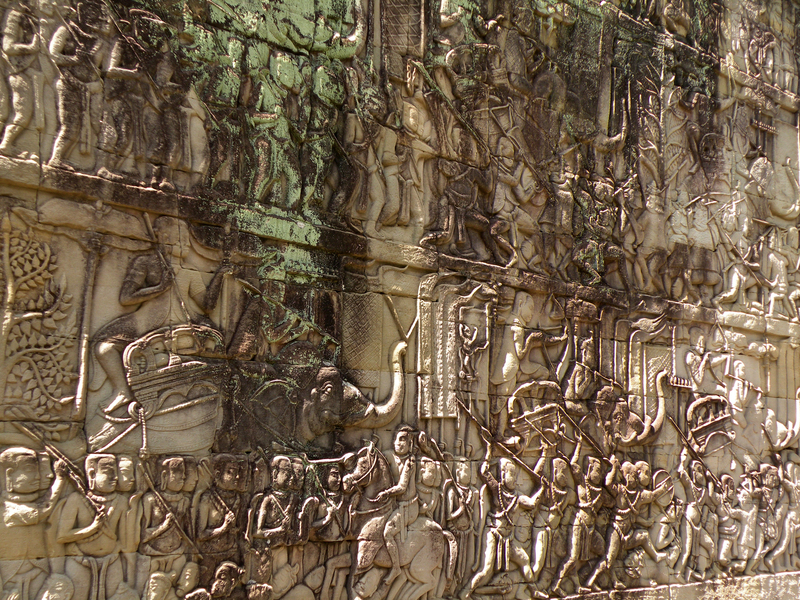 A three-level panorama of Jayavarman VII’s victory over the Chams. Linga worship. Worshippers bow before a linga (Hindu phallic symbol associated with Shiva). 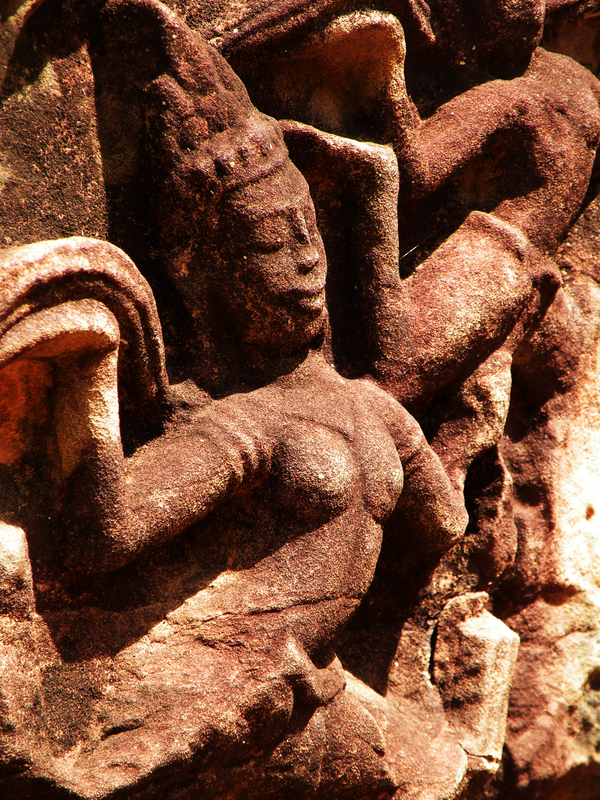 The revered object was probably originally a Buddha, but later altered by a Hindu king. A naval battle. Some of Bayon’s best-carved images, this section depicts scenes of a naval battle at Tonle Sap Lake and images of everyday life by the lake. The Chams are vanquished. Scenes of the defeat of the Chams on the shore, coupled with more images of ordinary life, such as a chess game, a cockfight, and women seeling fish. Military procession. 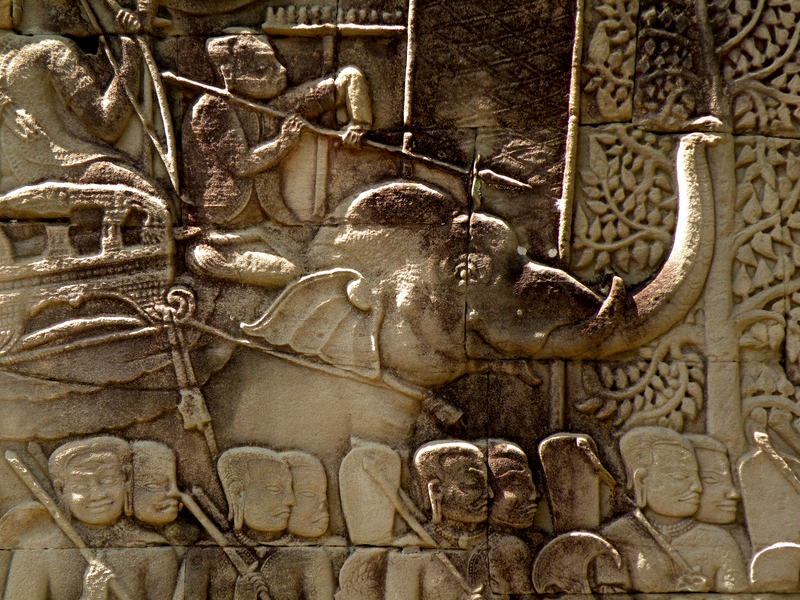 This section, which includes elephants being led in from the mountains, is unfinished. Civil war? Here groups of people confront each other, leading some scholars to believe it depicts a civil war. The all-seeing king. This interesting panel shows an antelope being swallowed by a giant fish and a prawn among smaller fish and includes an inscription proclaiming that the king will seek out those in hiding. Victory parade. A procession with the king carrying a bow. A Khmer circus at the western corner or the northern wall. A strong man holds three dwarfs; a man on his back spins a wheel with his feet; above is a group of tightrope walkers. The royal court watches from a terrace. A land of plenty. Rivers teem with fish. The Chams retreat. This narrative takes up most of the north wall. 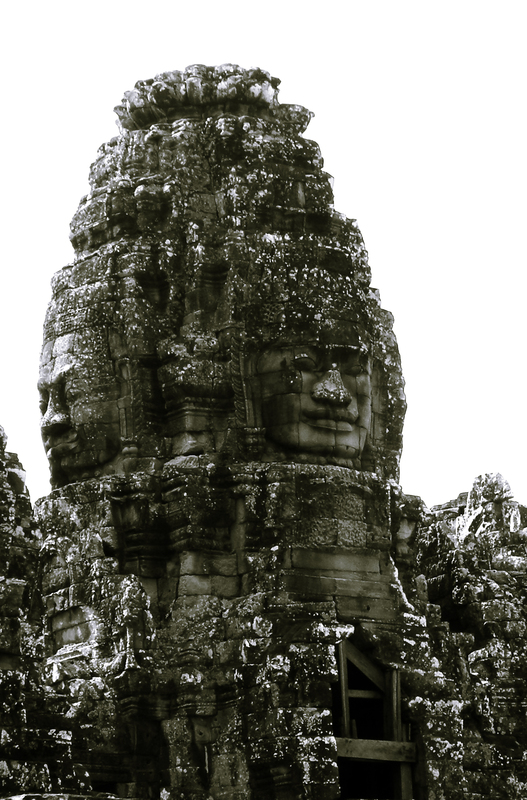 The Chams sack Angkor on the east wall. This panel depicts the war of 1177, when Angkor was defeated and pillaged. Above war scenes, despairing Khmers are getting drunk. 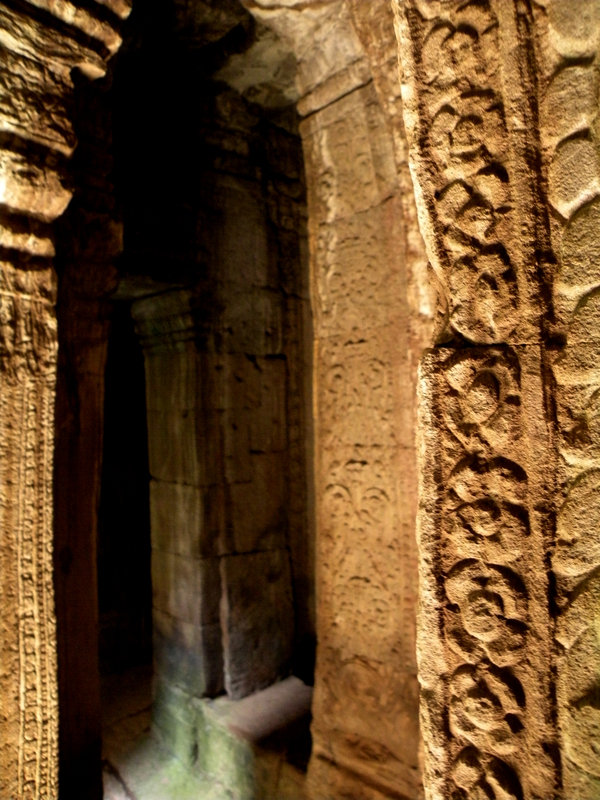 The ground floor of the temple, called also inner gallery, reminded me of a labyrinth full of mystery. The contrast between light and darkness was striking. Narrow passages, mythological reliefs, pillars all made me feel like being on a quest to find a treasure of long forgotten civilization. I know too much Tomb Raider (even though I don’t really like this film). 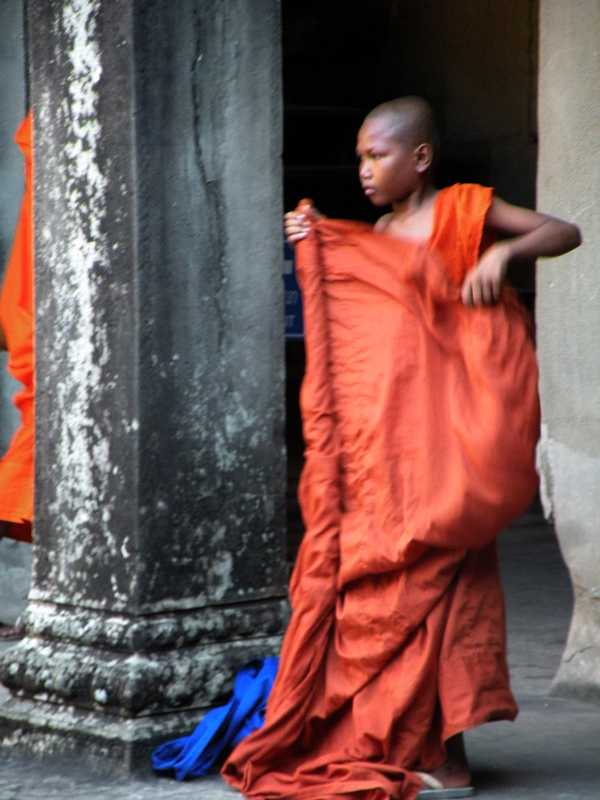 We also came across a few monks who seemed to be sightseeing just like we did. 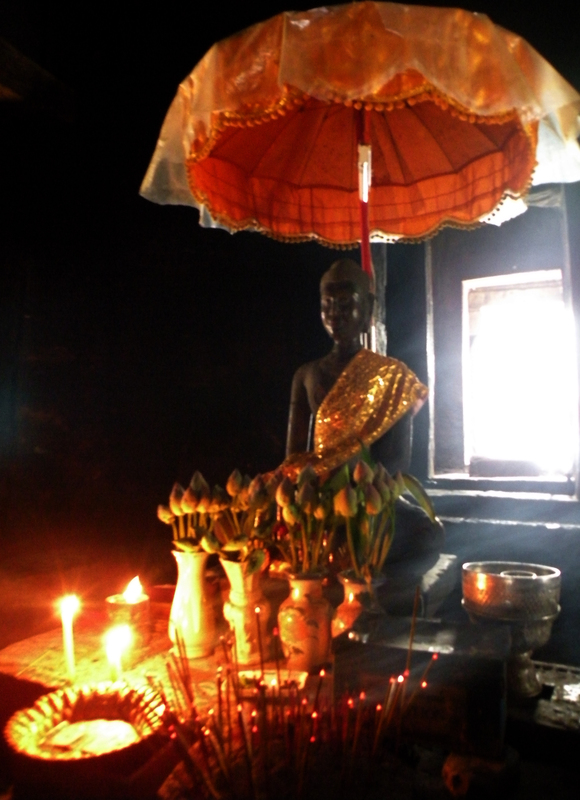 In the sanctuary located in the central tower you can see statue of Buddha where worshipers leave burning incenses and offerings. When I was in elementary school I remember receiving a book from my Mum as a birthday present. It was called “Strange Worlds Amazing Places” published by Reader’s Digest (polish edition). I think this was the first book that made me want to see distant lands. Beautiful pictures encouraged my imagination. I traveled before I got this book, seen a lot of Europe & USA mainly. This book allowed me to dream further that civilization known to me. 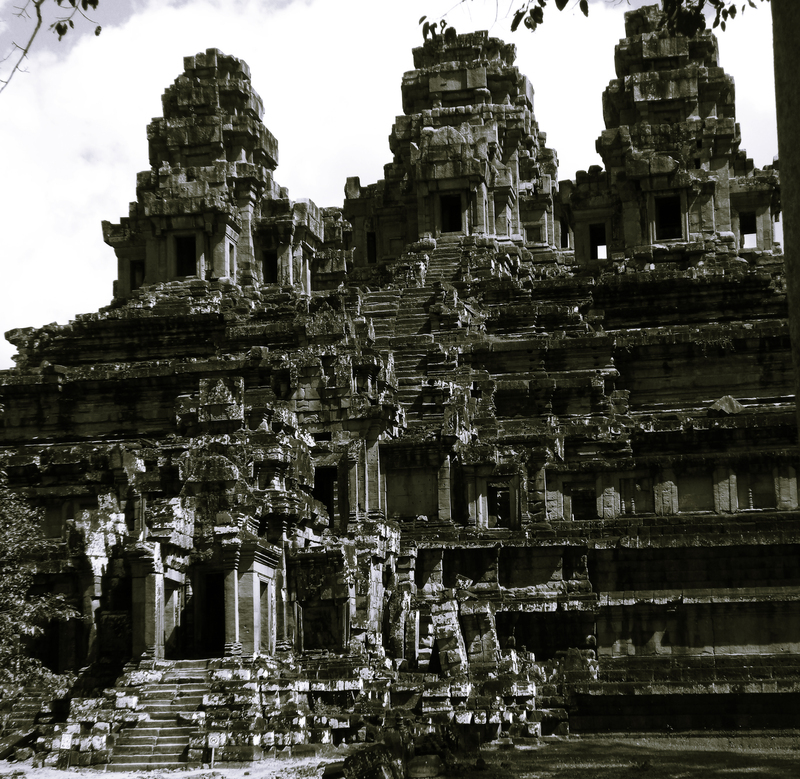 And so I came across Angkor for the first time that I can remember. Do you remember Mortal Kombat & Mortal Kombat II? I always thought at least one of them was filmed in Angkor but in fact for both pictures were taken in Thailand. 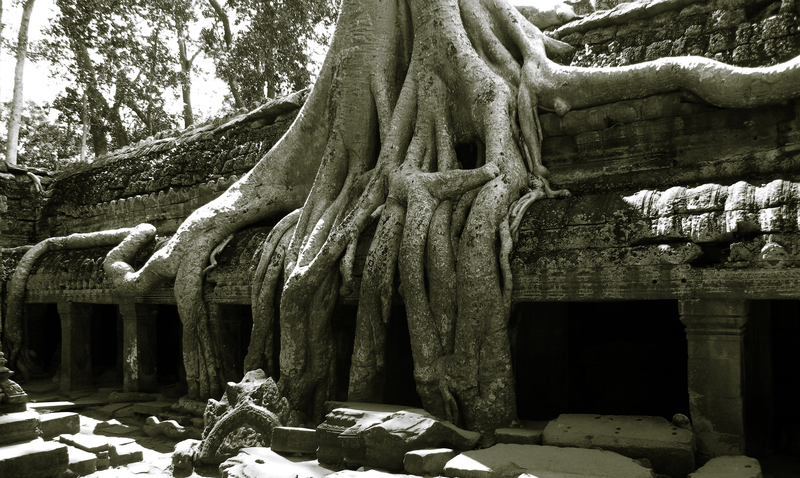 Although the Temple of Ta Prohm was used as a location in Tomb Raider. There were of course other films made there, among them The Killing Fields (1984), In The Mood for Love (2000), City of Ghosts (2002) and Two Brothers (2003). 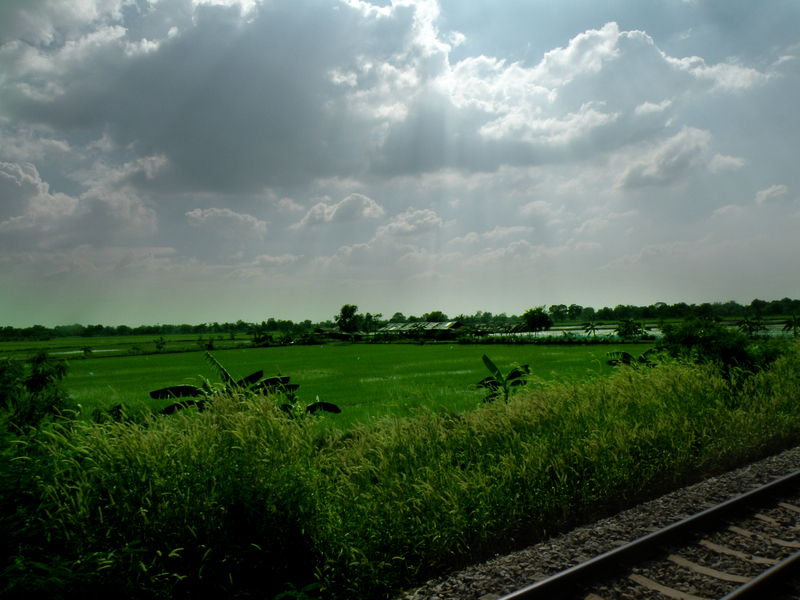 So there we were in the middle of nowhere, jungle on one side, endless rice fields on the other. 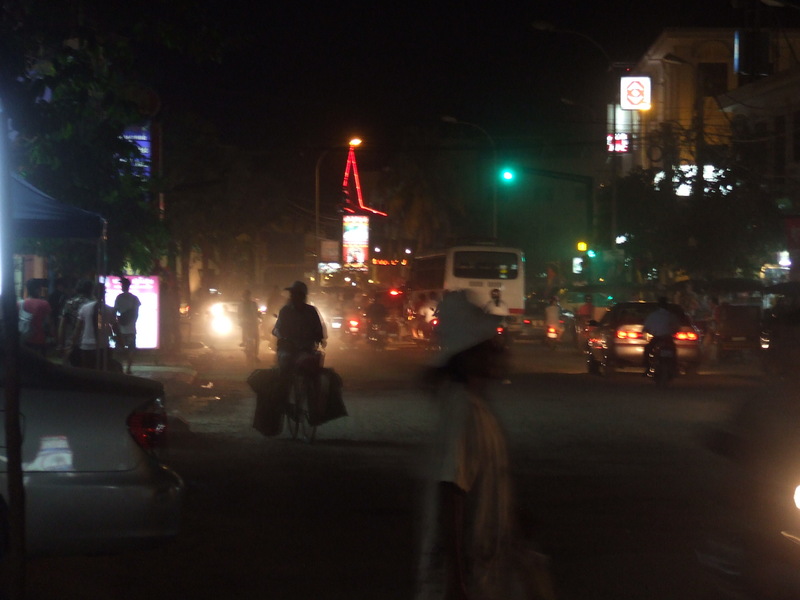 At least it seemed they were endless as we couldn’t see further that the lights of our taxi reached. The air conditioning in our vehicle was full on and we started to get cold. It was hard to communicate with our driver as he didn’t know English at all. – Can we turn the air conditioning off? And second it was. When we turned it off the damp air and smell in the car were unbearable. So we turned it on again. The driver just gave as a look “I told you so”. After a while, when we already started to yawn, a police patrol came out of blackness. They signaled us to stop. We looked at the driver, he seemed very reluctant, but he slowed down and stopped at the same time reaching desperately for his mobile. This did not alarm me right then. The policeman came over and knocked on the window. The driver didn’t react, he kept searching for a number in his mobile. The policeman knocked again. Now we were alarmed! Thoughts running through my head went something like this: “Who is more dangerous the driver or the patrol??? Are they looking for drugs, money or does the driver not have a license??? Should we run or stay?” The policeman knocked third time and the driver did not even lower his window. Another knock and the driver turned the inside light on. Uff.. this was enough for the policeman waved us away. Our new friend had GPS on all the way to the city, so we knew how much further we needed to go and if we were on the right track. Everything was alright until the driver turned on road shoulder on the outskirts of Siem Reap. “What the heck?” And there it started again. We asked him what’s going on, as an answer we got only silence. We tried again, still nothing. Then came the tuk-tuks (with the drivers) and told us to get out. We said we wouldn’t we paid to get to the city center and we want the taxi driver to get us there. So it went for at least 10 minutes. In the meanwhile taxi driver (very angry taxi driver) got out of the taxi for a smoke walking to and fro. We said we wouldn’t move and stopped even talking to those tuk-tuk drivers. Bare in mind there was only distant light from a nearby hotel in sight, we were in the middle of muddy shoulder 5km away from city center and very tired. Walking wasn’t an option. – Do you have a safe in the hotel? – But you do have a safe, yes? We put all the things we wanted to leave in the envelops and sealed them with stapler and waited to see where the guy is putting it, the safe is what we wanted to see. So we waited, and waited until it started to be awkward. He was tossing our envelops in his hands waiting obviously for us to leave. So we went outside the glass door and really slowly started to put on our shoes. You can guess we still wanted to see where he was putting them. But he was waiting. So we moved away behind the tuk tuk parked outside the door and kept observing. Still nothing. Finally deciding it was too ridiculous we made our way towards the center. Atmosphere was amazing. 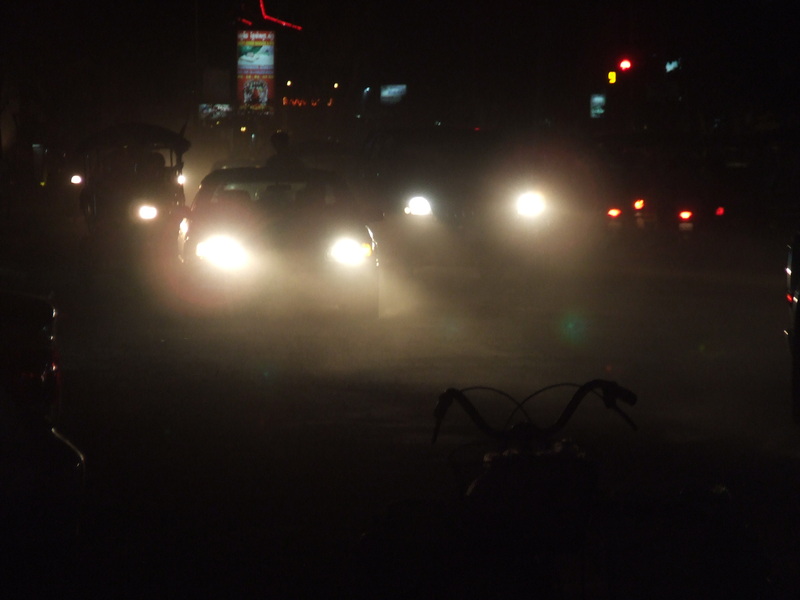 Dust everywhere, little light, people standing in groups on the side of the road, car, motorbikes and tuk-tuks passing us by all the time. We could only imagine that the damage to the roads was caused by the rains. It felt dangerous. music, restaurants and bars next to each other. 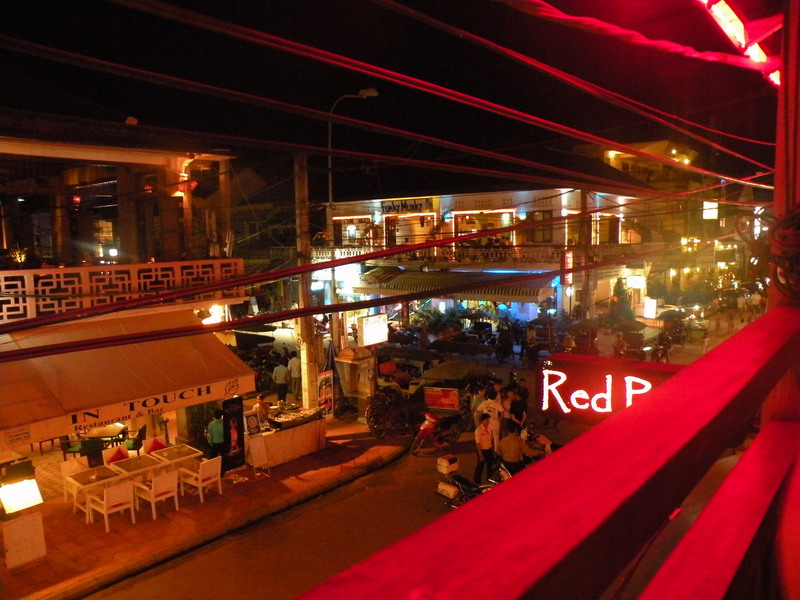 We were looking for traditional Khmer cuisine. Guess what! 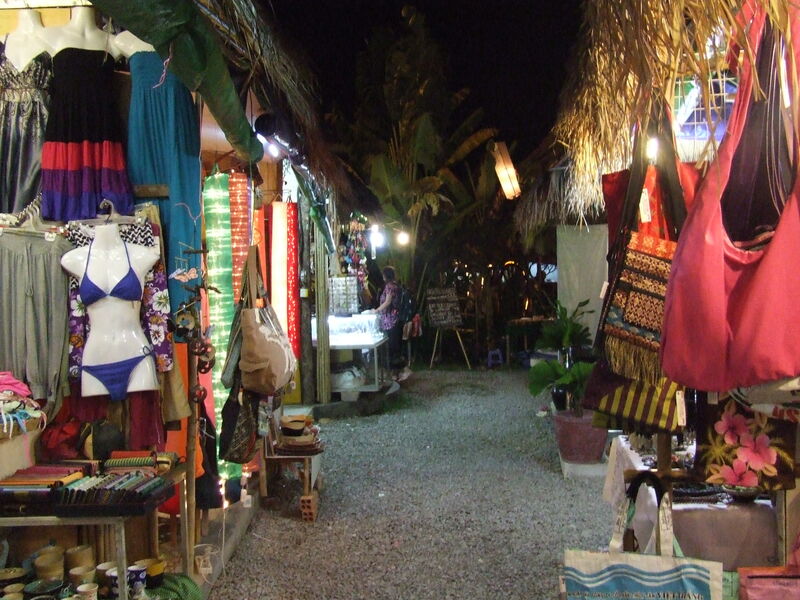 You can get everything: Italian, Mexican, Chinese… but not Khmer! 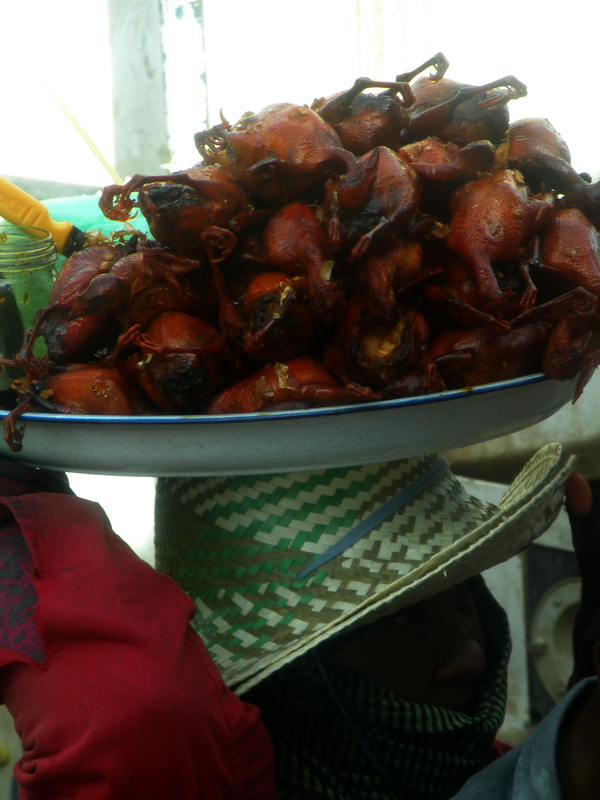 We kept walking down the street until we found some stalls with local food, cheap, freshly made just in front of us and tasty. Surprise, surprise we also met our friends from the taxi, so we shared the meal and went together to the night market. For that time we forgot all about our worries, about the hotel, safe and documents, at least until we decided to head back to the hotel. Right then we started to worry again. So we walked as fast as we could to get those things back. We got up around 11 am to meet Tony who took us to Angkor but more about it in the next post. 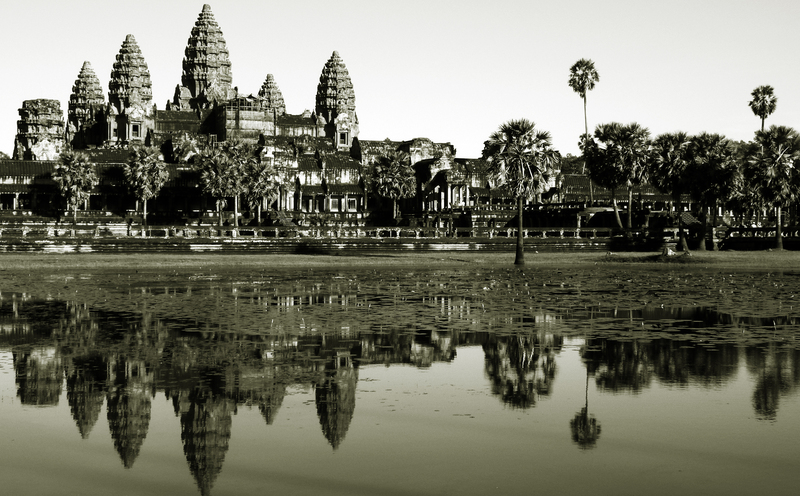 Let me know about your experiences in Cambodia and Angkor if you’ve been there! Any adventures? 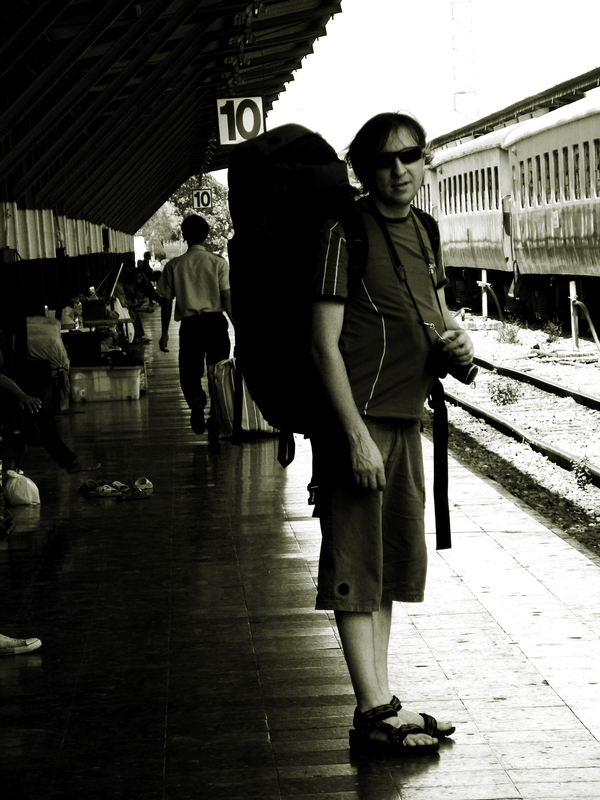 Here we are at the Bangkok train station on 6th November 2009 early afternoon. It’s my second time in Bangkok so yesterday – the first day we spent in bangkok, we were able to avoid some of the tourist traps tyros do encounter (more about it in a different post). 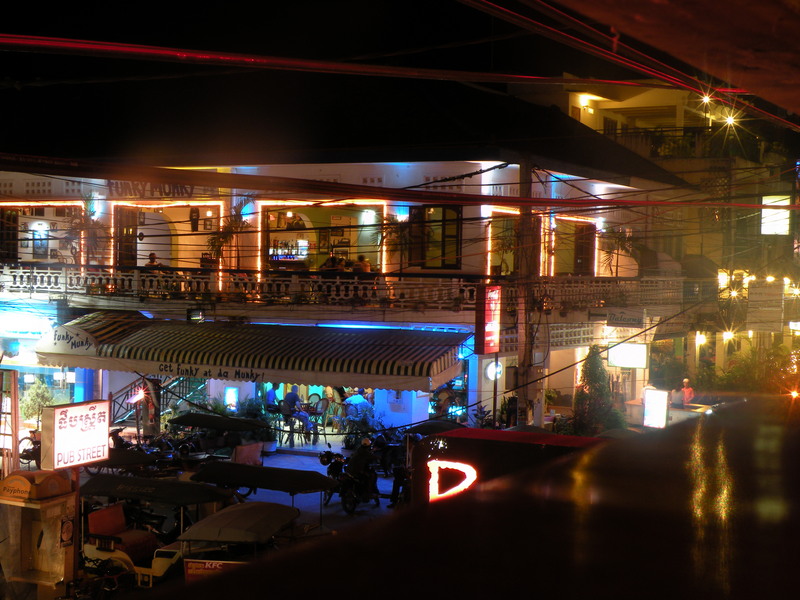 Nevertheless booking train tickets through the agency seemed easy and very tempting, mainly because we were to arrive in Siem Reap late evening and didn’t fancy walking from one hotel to another in strange city, tired with a heavy backpack. So we bought: train tickets to the Cambodian boarder, bus ticket to Siem Reap and overnight stay in a guest house; in the agency at the main railway station. Of course we overpaid, but well the journey was supposed to be smooth and comfortable. We are waiting for the train to arrive, expecting probably something like what you see in the pictures from India. 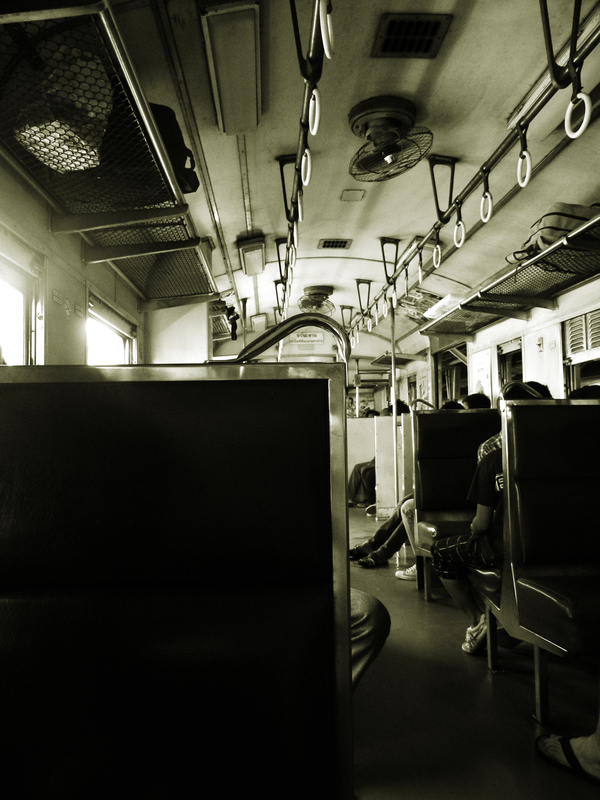 We read in our guide that you need to hurry to get seats as the trains are usually overcrowded. While we are waiting there is more and more people coming. I don’t think we spotted any other tourist among them besides two German guys with backpacks. Finally the train arrives and we are able to get in, interior looks pretty the same as in some old carriages in Poland, P says it might be even better. When we depart most seats are taken but there is no one standing yet. This is of course going to change along the way, there will be youth traveling from school, farmers with their crops, traders offering coconuts to drink and different kinds of food jumping on and off the train. The journey is fantastic. We can’t take our eyes from the view outside the window. 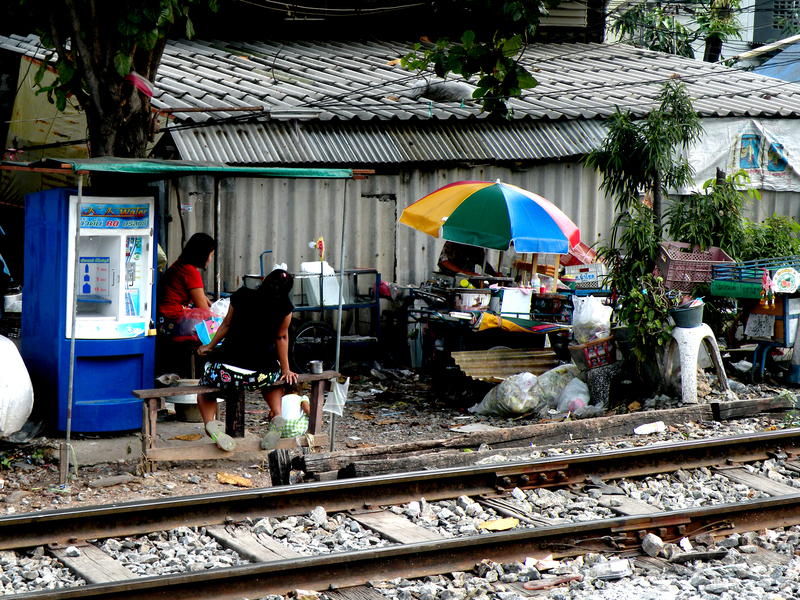 Firstly we observe life around the tracks with so many families using the space for their everyday life. Health and safety in Europe would never allow that. We can barely recognize where the stops are, as there are no platforms or signs. The train just stops and people get in. Then we come across group of graduates who have their pictures taken on the tracks. Is that for good luck I wonder… then the landscape changes and we come across rice fields, little cottages between palm trees just next to fish ponds, pastures and stations in the middle of nowhere. It’s the kind of sites you can only see while traveling by land transport. I’m so glad we didn’t take the plane. A person working for agency was going to wait on us at the final stop to take us through the border and lead us to the bus going to Siem Reap. Sounds good. We had no idea what time it was and it really didn’t feel like a long journey. When we arrived everyone suddenly seemed to be in a hurry. We looked around in search of our guides. 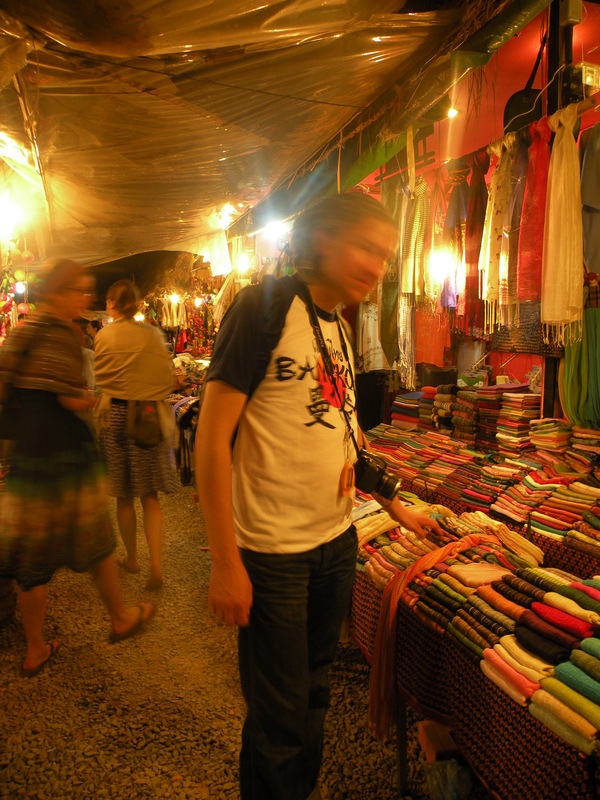 It was them who found us and insisted on moving quickly to a tuk-tuk. For those of you who don’t know what a tuk-tuk is: it’s a motor vehicle with three wheels used to transport passengers and goods, called sometimes auto rikshaw. There was an American couple who didn’t know where to go. I tried to help and offer them to come along with us but we got separated by our guides who insisted we move along faster. And so we did. There are plenty of tuk tuks for hire so if you travel by yourself, don’t worry you will be able to hire transport. I tried to assess if you could walk instead of hiring wheels and I think is doable. I recently walked to Dublin Port from O’Connell St in Dublin (so compare it to what you are willing to walk). Anyway we already had our visas from Cambodian Embassy in Bangkok (tip: if you are taking taxi get the address written in Thain alphabet not Latin), so we only had to fill out immigration cards supplied by our guides. You can get Visa and immigration card on the border. The first one is paid, the second free of charge (in case someone wants to charge you). So this is how it looked like: before the border our guide took us to table under a tent and asked to fill out the cards. We did that and waited for him for a while. He came back with another guy and the four of us approached the border post. Our guide told us he cannot cross the border but the other man will take us across and if we want to take out some money we should do it now, because in Cambodia there are no ATMs and a lot of pickpockets. He kept repeating how dangerous it is and we started to get nervous. It was getting dark by now and plenty of people with all types of bags, cases and carts were crossing the border. We did not know what to believe. We had $ so we didn’t feel it was necessary to take out any money, so we just kept on going. 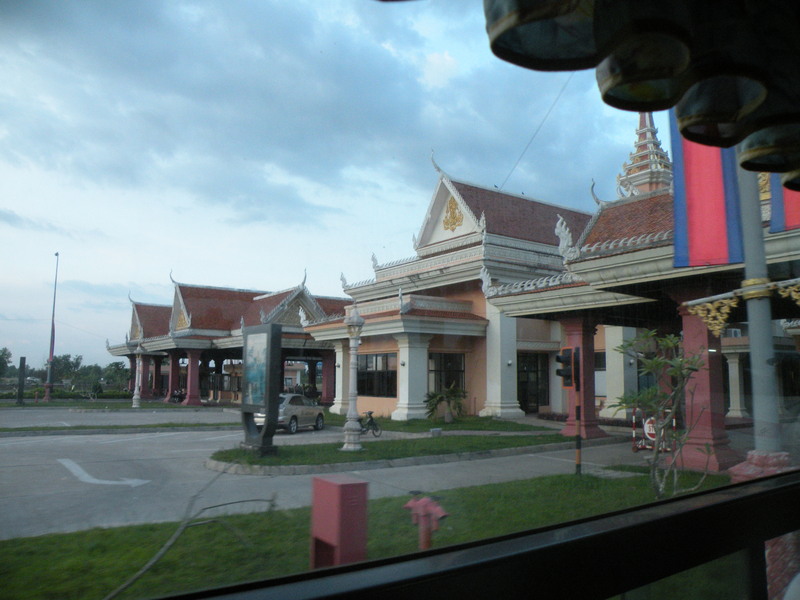 When we got to Thai border a man started to camrecord us, which felt really strange. The thought crossed my mind “is this for ransom purposes???!! !” It was really dark by then. We found ourselves in the stream of people walking in darkness. We could barely catch up with the man who was supposed to take care of us. We walked over a stream smelling of fish and dirt. People were brushing and bumping into us. I was getting more and more aware of the stress I felt… And then there was light. We thought we were already in Cambodia, but this was actually a zone of enormous hotels and casinos with limousines parked outside. Everything was luxurious and glittering, like some other world, Asian Las Vegas type of thing. 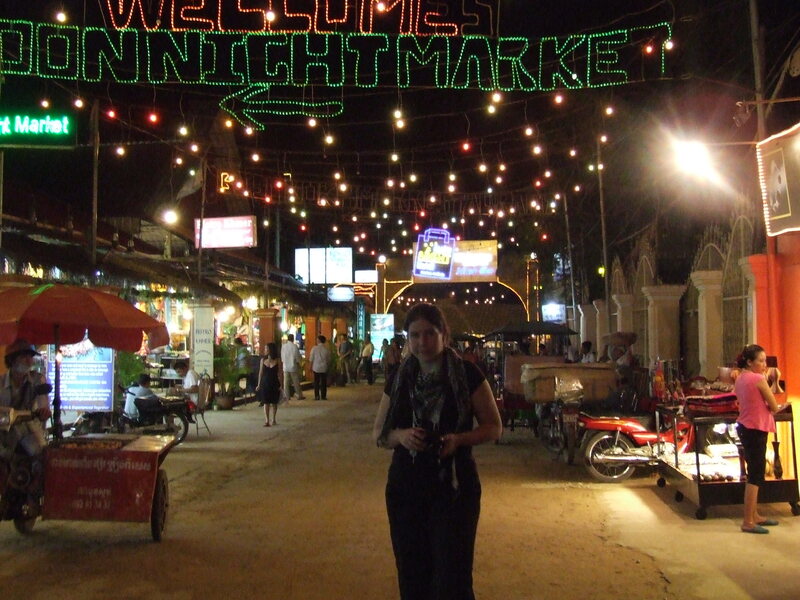 Now I thought about mob and drug lords, but we just kept on walking until we got to the Cambodian border. You know it’s communist country, so we were treated as all foreigners in communist country, which is something difficult to describe to someone who hasn’t experienced it. Let’s just say people are very unhappy when you disturb their “work” even when this work is supposed to be serving you. Just before approaching the official we met Polish couple traveling to Siem Reap as well. We quickly exchanged experiences and wished them farewell. When we got to the other side P had to go to the toilet so I stayed with the luggage waiting. The man who crossed the border with us just then told me that the train was late and so the last bus is gone and now we need to pay for a taxi to get to Siem Reap. I got really angry, I said I didn’t care, that we paid for the transport and it’s their problem to provide us with replacement. and I kept saying: “I don’t care I paid!” (believe me I know it wasn’t constructive but I was too tired to care). So it went until P came back and the couple we met earlier suggested we could share a taxi. Suddenly we found ourselves surrounded by taxi drivers, touts, our guide and Polish couple. Everyone wanted to pull us in different direction, shouting and convincing us we should come with him. We couldn’t even talk to each other to decide what we want to do. Next minute an old bus approached us and our guide told us to get in so we can drive away where taxis are cheaper than here. There was another tourist already on the bus reaching his hand towards us. We looked at the bus, at the guide and decided NO WAY! So we shared the taxi for $30 (for the whole car). Our guide was really mad that we didn’t do what he wanted. And told us to give back our transit tickets (the ones we got at the agency). We thought “well obviously he needs them, fine let’s get it over with!”. So we took off happy to be on the way, chatting about our trips and places we’ve seen, when suddenly a police patrol started to flash light at us in the middle of nowhere and our driver did not want to stop… but I will tell you all about it in the next post.